Franklin County Community School Corporation (FCCSC) of Brookville, IN has selected Qualite Sports Lighting’s Pro Series System to meet the lighting needs of multiple athletic fields. 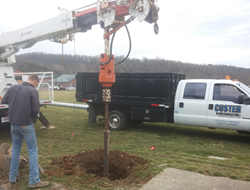 Qualite's Pro Series Lighting System installation at Franklin County High School Athletic Fields by Custer Electric. Franklin County High School in Brookville, IN has selected Qualite Sports Lighting for the highest quality lighting systems to light Baseball, Softball and Soccer Athletic Fields. Each venue will be illuminated with the Qualite Pro Series Lighting System, with visors for optimum spill/ light control. A total 112, 1650 watt fixtures will ensure an excellent experience for the athletes and fans. Craig Custer of Custer Electric states, “Qualite’s Pro Series is a perfect fit for Franklin High School Baseball, Softball and Soccer Fields. This is the first ever lighting project for these facilities and we’re proud to help expand the playing and practicing opportunities, while also understanding budgetary considerations. It’s a win/win for all.” Qualite offered direct embedded steel poles, which have a 30 year standard warranty from Qualite. The addition of Qualite’s Pro Series Lighting System allows for the school to host sectional and regional sporting events on their campus. Franklin High School was constructed in the early 1990’s. Qualite has been the Sports Lighting Partner for High Schools, Colleges, Parks and Recreation Departments, and Minor and Major League Professional Sports Franchises for over 30 years. In addition, Qualite has partnered with an LED Manufacturer to provide the highest quality LED Lighting Systems for sports facilities including retrofits and new construction for University of Phoenix, Minnesota Vikings, High School Stadiums, College Facilities and Park & Rec Fields across the US. Qualite's Q-LED System is the most Energy-Efficient, Highest Lumen Output LED Lighting Solution in the Sports Lighting Industry.